There is only a genuine issue of material fact in mold exposure if the plaintiff is able to demonstrate through expert testimony that mold exposure generally causes the type of injury the plaintiff experienced and the exposure to mold caused the plaintiff’s specific injury. In Terry v. Caputo, the Ohio Supreme Court adopted the above test and reversed the case because the plaintiff failed to demonstrate with medical experts that exposure to mold caused the specific injury at issue. Ottawa County Board of MRDD leased several suites from W.W. Emerson, and shortly after its employees began to experience headaches and physical ailments. The Ottawa County Board of MRDD conducted a building inspection and found mold in several locations. The employees’ ailments were attributed to the damp conditions in the building, which was subsequently cleaned. The symptoms eased but returned shortly. Further testing revealed several mold spores, including a type of mold that can cause the symptoms the employees experienced. At trial, the plaintiffs’ medical expert had not personally examined the employees during their exposure to mold, but reviewed their medical records and concluded that the plaintiffs’ symptoms were caused by mold, mildew, and poor ventilation. The trial court granted summary judgment for the defendant – summary judgment is when a court decides if either or both of the parties are able to present evidence regarding each essential element of a claim – because the plaintiffs failed to present medical evidence that their symptoms were directly caused by the mold. The court found the plaintiffs’ medical expert’s conclusions were broad and correlative rather than specific to the plaintiffs. The appellate court overturned the trial courts decision to exclude the plaintiffs’ medical expert’s testimony with respect to general causation. However, the appellate court affirmed that the medical testimony did not prove specific causation because the expert relied too heavily on a temporal relationship. The appellate court reversed the grant of summary judgment because the plaintiffs could still demonstrate specific causation through additional evidence. The Ohio Supreme Court’s Reasoning – How Do You Prove Mold Caused Your Illness? Prior to this case, the Ohio Supreme Court had yet to rule on this specific issue. The court acknowledged the issue had been frequently considered in federal courts and adopted the test outlined in Knight v. Kirby, which required the plaintiff to demonstrate both general and specific causation. Step one of the Knight test is to prove the plaintiff was exposed to a type of mold (or other toxic substance) that can cause the particular injury experienced. The second step is satisfied if the plaintiff is able to demonstrate the mold, in fact, caused the specific injury in dispute. To establish both general and specific causation, a plaintiff must present an expert witness. Expert testimony is governed by Evidence Rule 702, which requires, in part, that an expert witness base his or her testimony on reliable, scientific, technical, or specialized knowledge and the expert’s theory must be objectively verifiable or validly derived from widely accepted knowledge, facts, or principles. In determining if expert testimony should be admitted trial courts are privileged with the role of “gatekeeper,” which gives trial courts discretion to analyze the reliability and relevance of the expert’s testimony. Appellate courts should only overturn the trial court’s determination if the trial court has abused its discretion in deciding the expert testimony was not reliable or relevant. Expert testimony is reliable if the methodology has been subject to peer review, if the methodology is not known to have a high error rate, and if the methodology is generally accepted in the scientific community. Courts should only be evaluating the reliability of the methodology, not the results. In addition, expert testimony is considered relevant if it advances the matter at hand, which means there is a connection between the scientific research and the test results. This two-step inquiry has been described by a federal court as determining the scientific validity of a particular theory and analyzing the reliability of the expert’s application of the tested principles. Finally, the Ohio Supreme Court relied on two Virginia cases in which motions for summary judgment were granted and upheld because the expert’s medical testimony was unable to prove the particular type of mold that caused the ailment and the expert was unable to rule out other causes of the plaintiff’s symptoms. When both cases were appealed, the California appellate courts held that the trial courts acted properly in their role as a gatekeeper because the trial courts had determined the expert testimony was not reliable or relevant and was too heavily on temporal correlations. The Ohio Supreme Court ruled that the appellate court properly held that the plaintiffs’ expert testimony was sufficient to establish a generally connection between the type of symptoms exhibited by the plaintiffs and the type of mold that was discovered at their workplace. The court also held that the appellate court properly determined that the medical evidence was insufficient to establish that the mold was the specific cause of the plaintiffs’ symptoms. However, the court held that the trial courts summary judgment should have been upheld because the plaintiffs’ failed to establish that the mold was the specific cause of the ailments. As a result, the Ohio Supreme Court upheld the appellate court’s test but reversed and granted summary judgment. Justice Pfeifer was the lone dissenter who argued that the majority’s test was correct, but not its application. Pfeifer argued that the prior case law, which the majority relied upon, involved the plaintiff’s expert testimony at trial, but in the present case, the court was only deciding if summary judgment should or should not be granted. In other words, was there a genuine issue of material fact that the mold caused the specific type of symptoms exhibited by the plaintiffs? Pfeifer argued that general medical causation is sufficient to overcome the low burden of summary judgment. What Does This Mean for My Mold Exposure Claim? A motion for summary judgment occurs relatively early in the litigation process and the court’s holding in Terry v. Caputo establishes what evidence the parties must be able to demonstrate in mold or toxic exposure cases to successfully survive the motion. If the parties are unable to demonstrate both general and specific causation the parties will see their cases dismissed before trial. Obviously, these are complex issues, and it may be wise to talk to an attorney well before filing a lawsuit or insurance claim to ensure your case is handled correctly. If you have a personal injury claim, don’t go it alone! Lawrence & Associates may be able to help! 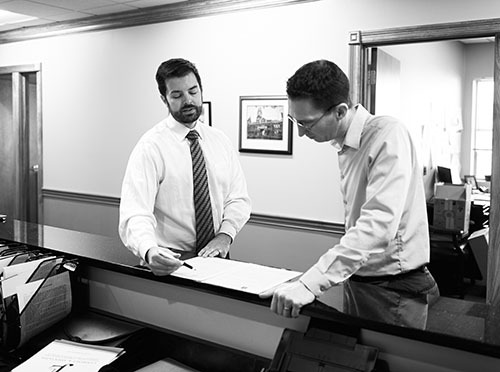 Our attorneys offer free consultations, or can refer you to another credible firm. Call us today – We’re Working Hard for the Working Class, and we want to help you!